MELBOURNE, Florida -- Duncan, an 11-year old Reticulated Giraffe, was euthanized late Wednesday afternoon after Brevard Zoo veterinary professionals determined that there was virtually no chance he would recover from the onset of capture myopathy. Born at the Knoxville Zoo, Duncan was one of the first giraffes to arrive at Brevard Zoo in 2003 for the opening of Expedition Africa. Duncan was known for his reserved nature and tall stature. He was long and lanky, more than 18-feet tall and the tallest member of the Zoo herd. Giraffes, like many other hooved animals, are highly susceptible to capture myopathy, which is a stress-related condition that destroys muscle tissue. Duncan had suffered from chronic lameness in his front legs for the past two-and-a-half years. The Zoo had been treating Duncan with a combination of anti-inflammatory medications and rest, but recently the condition had worsened and led to abnormal hoof growth. Because of their size and gait, lameness in giraffes is a life-threatening condition, so the Zoo’s animal care staff prepared Duncan for more aggressive treatment. Duncan was trained to stand in a restraining chute, so that the veterinary staff could treat him. On Wednesday morning, Duncan was walked into the chute and given sedatives to calm him. After 50 minutes, the procedure was stopped because Duncan never settled down. He left the chute under his own power, but then went down on the ground. He made several attempts to get up but was unsuccessful. Zoo staff administered fluid and other medications, but after five hours of trying to help Duncan return to a standing position, it was determined that he was suffering from capture myopathy and would not recover. 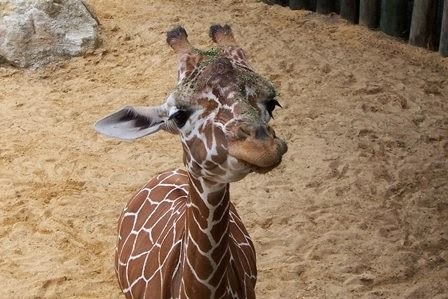 “For the last ten years, Brevard Zoo has had a large and growing herd of giraffes, and although we always knew the day would come when we would lose one, it is still very tough on all the staff and volunteers who love these remarkable animals,” said Keith Winsten, Executive Director. Brevard Zoo’s remaining herd includes Raffiki, a breeding male, and Milenna and Johari, two breeding females, along with their offspring Zanibu, Gage and Sherry Noelani. Also with the herd is Doc, another male giraffe. Four other giraffe have been born at Brevard Zoo in the last seven years and now live at other zoos in Florida and Virginia.